"The most brilliant man I've ever met” (Allen Ginsberg). A "unique and pivotal figure in the literary world of the 50's and 60's, an individual, that's it...they don't make 'em like that anymore" (William S. Burroughs). 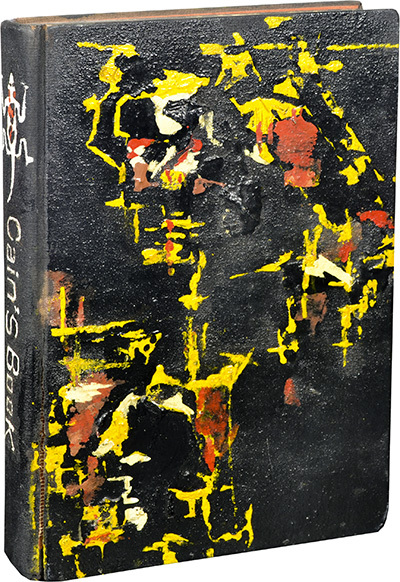 "It is true, it has art, it is brave, I wouldn't be surprised if it is still talked about in twenty years" (Norman Mailer, on Cain's Book). Mailer underestimated by at least thirty-three years. 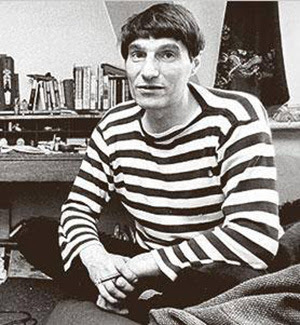 In 1961, Alexander Trocchi (1925-1984), the Glasgow-born novelist who, in Paris during the early through mid-1950s as the bridge between the Beats and Europe, had established himself at the center of a group of British and American ex-pat writers in Paris, and, in the late '50s moved to New York City, was in trouble, major big-time. World literature's second most famous junkie author, William S. Burroughs taking the top spot, Trocchi had provided a sixteen year old girl with heroin. In response to an epidemic of heroin addiction that was non-existent, the United States Congress passed the Boggs Act in 1956, draconian legislation that mandated the death penalty for providing heroin to a minor. The evidence against him overwhelming and, arrested and arraigned, Trocchi was released on bail. But while awaiting a trial that would have sent him to the electric chair if found guilty, Trocchi appeared in a televised debate about drug abuse. During the live proceedings he nonchalantly shot-up. He immediately became the face of evil. His bail was revoked and he was under threat of immediate re-arrest and incarceration. He had to get out of New York and the U.S., pronto. He had no money. The income generated by his partner in addiction, his wife, Lyn, who prostituted herself to support their habits, was not sufficient to effect a getaway. 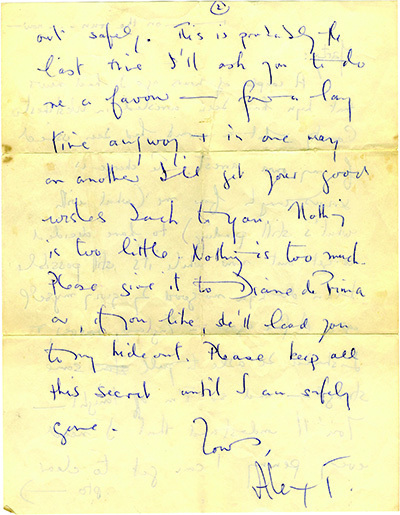 He turned to a bookseller friend for financial help, writing him a letter. 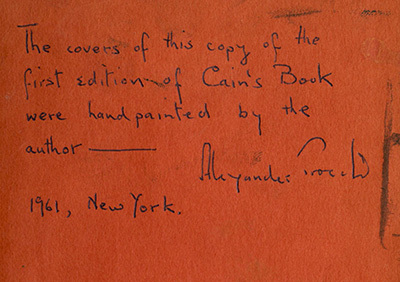 That plea has just come into the marketplace, along with Trocchi's personal, hand-painted copy of Cain's Book (NY: Grove Press, 1960), his autobiographical novel and literary triumph, banned in Britain upon its publication there in 1963, recounting his days and nights as a writer in New York while working as a scow pilot on the docks, scoring junk and getting high. Trocchi was so far gone that he was unable to attend the book's release party. "This is probably the last time I'll ask you to do me a favor - for a long time anyway + in one way or another I'll get your good wishes back to you. Nothing is too little, nothing is too much. Please give it to Diane Di Prima or, if you like, she'll lead you to my hide out. Please keep all this secret until I am safely gone. With the assistance of Norman Mailer, a major fan and supporter, Trocchi was spirited across the border into Canada, where he was met by Leonard Cohen, then a young, aspiring poet. A few days later, after surviving Trocchi's company - hanging-out with the mad Scot presented multiple opportunities for too much excitement, often at the same time - Cohen smuggled him aboard a steamer bound for Aberdeen, providing, to Trocchi's ecstatic relief, "enough Demerol to kill a herd of elephants." Trocchi, who had been a leading literary light in Paris, publishing the acclaimed avant-garde journal, Merlin, and (along with his friends, including Terry Southern) writing erotica for Maurice Girodias's Olympia Press (under the pseudonyms Carmencita de las Lunas and Francis Lengel), eventually settled in London and continued to write but published very little; his addiction was deep and taking its toll. He died of pneumonia in 1984. Almost immediately afterward, interest in his career became resurgent and intensified and he earned, the hard way, the post-mortem accolades accorded to a literary genius who channeled his gift through a 26-gauge needle squirting diacetylmorphine into his bloodstream in an existential rebellion to separate himself from a world he rejected and surrender in thrall to the muse of nothingness and, in the process, lose everything that remained meaningful to him. This copy of Cain's Book - the most important copy imaginable - and this letter chronicle his most significant and lasting contribution to literature, his career height and the incident that, as inevitable as a Greek tragedy, instantly toppled him. Images courtesy of Royal Books, currently offering this item, with our thanks.